1. 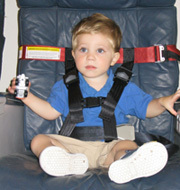 All persons over 2 years of age will wear an approved seat restraint during surface movement, take off, and landing. Only one seat belt per person over the age of 2 is authorized. 2. KaiserAir, Inc. is required to allow the use of an approved child restraint system on its aircraft when requested and when an approved child restraint system is provided by the child's parent, guardian, or attendant and when a ticket is purchased for a passenger seat in which to place the restraint system, or when a passenger seat is otherwise made available by KaiserAir, Inc.
3. Flight Attendants will ensure that the child restraint system is properly secured to a forward-facing passenger seat and that the child is properly secured in the child restraint system and that the child does not exceed the maximum weight limit for the restraint. The Lead Flight Attendant is responsible for ensuring child restraint seats are installed in accordance with KaiserAir, Inc. procedures. 4. KaiserAir, Inc. may refuse a child restraint system that has an obvious defect and, in the operator's or certificate holder's judgment, may not function properly. 5. The child must be accompanied by a parent, guardian or attendant designated by the child's parent or guardian to attend to the safety of the child during the flight. "This child restraint system conforms to all applicable Federal motor vehicle safety standards." Vest- and harness-type child restraint systems manufactured before February 26, 1985, bearing such a label are not approved for the purposes of this regulation. "THIS RESTRAINT IS CERTIFIED FOR USE IN MOTOR VEHICLES AND AIRCRAFT" in red lettering. The FAA “CARES” child safety device is a harness type restraint system approved for children weighing between 22 and 44 pounds. This device will have a label stating "FAA Approved in Accordance with 14 CFR 21.8(d), Approved for Aircraft Use Only" or "FAA Approved in Accordance with 14 CFR 21.305(d), Amd 21.50 6-9-1980, Approved for Aircraft Use Only"